Sports Bra – Ladies – Truly Your Very Best Fitness Friend! 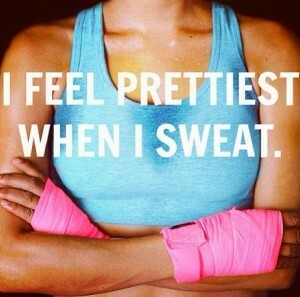 Sports Bra Ladies: Workouts are NOT the time to let it hang or for the frilly little number! I see this mistake every day of my life. Sorry for being so blunt but not reigning in “the girls” during physical activity – Big Mistake! Irrelevant of size, for aesthetic, health, posture…. wearing the best sports bra is your most important piece of fitness equipment. Just because it is a name brand, or the brand makes frilly popular regular bras, does not imply the exercise bras are effective. There is no question, especially if we exercise in a public place such as a gym or going out for a run – we want to feel attractive – let’s face it, it makes us feel better about ourselves, which helps us maximize our effort and performance. The money women spend on the cutest workout tanks and shorts never ceases to amaze me. 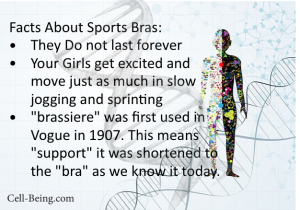 The fact is a good sports bra should reduce breast movement by 50%. Breasts can move about 14 cm up and down, side to side in training. A really good sports bra has been proven to reduce this up to 75%. The most important investment in workout attire by far are the right workout shoes for your shaped foot and gait, and the the best possible workout bra. My picks are listed below. Women have become much more in tune with breast health – a supportive bra is an imperative part of breast health. But please choose a bra that still makes you feel attractive, yet meets certain criteria. Yes, you will find one. Cooper’s Ligament – help her out please!!!! Very simply – connective tissue that gives the breast that beautiful shape. The force of gravity, multiplied by impact…not a girl’s best friend. Nobody wants sagging breasts. A certain amount of impact is a necessary aspect of exercise – mineralize those bones – but as everything in life there are good points and not so good. Movement and impact tears at the elastin & collagen, which are not as resilient over time to start with. And BTW – there are GREAT strength training exercises to give Cooper hope and strength! Cooper also believes in slow and steady wins the race……quick weight loss elicits rather spiteful hormonal responses – which further miff Cooper. Back, shoulder and neck strain: Posture is another gift. Both a lack of wearing the right fitting sports bra & a lack of a sports bra at all can cause great pain and erode posture. Wear a bra that offers support all around – so shoulders do not carry the burden which often causes us to curl forward, placing stress on the neck. We should still be able to keep good posture with shoulders back. Especially important for larger cup sizes. I happen to be a big supporter of wider straps, racerback bras, not just a compression bra, but encapsulating (complete cups around each breast). Don’t like underwires? There are MANY sports bras available now that are excellent, without an underwire. Breathing: Yes breathing is a critical aspect of exercise. Tugging breasts (ouch at just the thought) can easily cause a shortness of breath. Proper oxygen consumption during exercise, full deep breaths is #1 to fitness. Heart Health: I will say I have NOT seen direct studies on this….however I refuse to believe heavy breast movement is good for the heart. Just the obvious shortness of breath is a huge strain on the heart. I fully suggest a sports bra for active days. It doesn’t have to be the full support for athletic training – however breast movement can happen and challenge even at lower activity levels. Please, no built in bra tops for working out. Poor impostor. Please do not choose a bra according to what your girlfriend wears. Your relative size between back width and cup size will severely influence choice of sports bras. Larger cup size, smaller back – slam dunk for the most difficult shape to fit. Very few things in life are forever. Your sports bra is NOT one of them.